During the opening shot of Karel Kachyňa's Carriage to Vienna, you can imagine what is to come. Wheels are heard rolling down a dirt road through a lush evergreen forest, inspiring thoughts of a splendidly adorned horse-drawn carriage making its way to the so-called City of Music, pride of Austria. Inside the coach, the fair and delicate daughter of an esteemed nobleman anticipates a rendezvous with a certain handsome gentleman. A lady in waiting attends to the necessary primping, ensuring that everything is just exactly perfect. Baroque orchestral music emanates from deep within the woods, and a mystical fog hovers between the trees. Magic is in the air. An amazing night awaits: opera at Theater an der Wien, coffee and cakes at a quiet garden café, and an appearance at an exclusive ball in the Ceremonial Hall of Hofburg Palace, where the waltzes of Strauss and Brahms will have them dancing until dawn. La-di-da. Isn't life grand? Then you wake up from your daydream and realize that Carriage to Vienna is a dark, rough, gritty war drama, not some syrupy romantic fantasy suitable for a 15 Kleenex bon-bon fest. The carriage is little more than a cart, certainly not something in which anyone would want to show up at a ball. Tall trees block the sun, creating a gloomy world where the fog is not magical but ominous, opera is out of the question, and few eyes can see what happens along the shadowy road. Also, as it turns out, the cakes are a lie. Krista, the leading lady, is no foofy princess type, but a tough Czech chick who is furious and quite willing to take it out on Hans and Günter, a pair of soldiers who picked the wrong day to mess with her. Had they known what kind of week she had been having, they may have chosen a different cartjack victim, likely resulting in them having an easier trip, though perhaps with a less capable driver. Their failure to make a well-informed decision means Hans and Günter are in for a hell of a ride, and there won't even be coffee to adjust anyone's attitude. Back in the day, some government folks decided that nobody should watch Carriage to Vienna something about non-compliance with party propaganda guidelines, so they shut down production before shooting was complete. 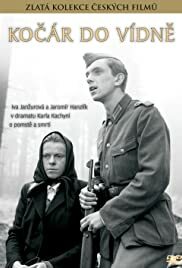 Co-writer Jan Procházka demonstrated the advantage of being well connected by obtaining permission for the movie to be finished, only for it to be shown once in 1966 and then banned until the communist government was booted out of Czechoslovakia in 1989. Fortunately, the film was well preserved while locked away, and now we can watch it in relatively high quality, commie propaganda guidelines be damned.